Print Your Water Conservation Graphic | Jimmy Kimmel Live! Here in California, we are in the middle of a very serious drought. 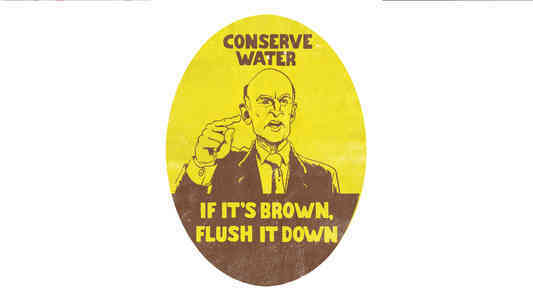 Governor Jerry Brown just imposed permanent water conservation rules and suggested that the drought might not ever end. That's why we hired a team of conservation scientists to develop a toilet seat insert featuring our Governor that says "If it's Brown, Flush it Down." Just print out the picture, cut it into a toilet seat shape and then tape it to your toilet.